As the countdown to Christmas rapidly approaches, more consumer are turning to the Internet to complete their holiday shopping lists. Last year $24 billion was spent through electronic shopping during the month of December alone. This trend will continue to increase according to the National Retail Federation as nearly half of all consumers plan to use the Internet to complete their holiday shopping this year. “With the ‘hustle and bustle’ of the holidays it’s easy to become complacent and rush through online shopping transactions. 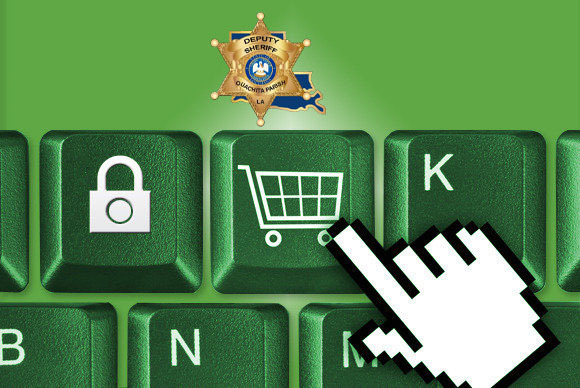 The convenience of online shopping could quickly become an inconvenience should your personal information fall into the wrong hands,” said Sheriff Russell. Choose Credit Over Debit. This may seem like unconventional advice, but credit cards offer protection from identity theft that debit cards don’t. There is greater risk in using a debit card because should someone gain access to your banking account, they could clean it out before you even learn there’s a problem. So, whenever possible, use a credit card instead of paying the bill off monthly. Disposable is Better. Even better than using a credit card is to use a disposable credit card. Disposable credit cards work just like most gift cards. You add a specified dollar amount to the card, and it’s good until that is gone. Once it’s gone, you can add more, or purchase a new one. And both Visa and American Express now offer these cards in varying amounts so they are easy to get hold of. The bonus is that if the number from a disposable credit card is stolen, it’s anonymous, and criminals can’t gain access to anything more than the dollar amount that’s still available on the card. Verify Web site Security. Be sure you are shopping on a secure Web site. If the site you are shopping from is not secure, criminals can capture everything that you enter onto a form from those sites, including your personal and credit information. Secure sites begin with HTTPS:// instead of HTTP://. Secure sites will also have a small lock icon in the lower right corner of the screen. Don’t Shop Publicly. If you plan to do any shopping online, do it at home. If you’re using a public computer—at the library, at a coffee shop, or at work—to do your shopping, you have no control over who else might be using that computer. Shop at home, it’s much safer. Don’t Store Information Elsewhere: Many major shopping sites offer you the ability to save your credit card information on their servers to speed the shopping process. Although this might make online shopping more convenient in the future, it is risky to maintain your personal information elsewhere. If the company you’re shopping with has a data breach, your personal information could be compromised. Be Wary of Unusually Low Prices. When searching for the best price online, similar items typically fall into a general price range. If one falls way below that range, be suspicious. Scammers use ridiculously low prices to lure consumers to their ads. If the deal seems too good to be true, it probably is. Read the Fine Print. Always look for a merchant’s return policy and study the fine print. Keep in mind that most likely you will have to pay the return shipping although some merchants will pay return shipping costs if the item is defective. Also, be sure to look for purchase and delivery deadlines which most merchants publish from a link on their home page. Use Common Sense. If a shopping experience does not feel right, pay attention to the warning signs and verify that the site and seller are safe before proceeding with the transaction.